The music and poetry of everyday life: musical melodies, the chatter of children, fairy tales, eclectic food, fresh colors and interesting shapes from the stunning Southwest landscape, inspire my work. My artistic antennae tune in to the creative stimuli and consistently transform them into visual images that create my paintings. After deciding the theme and color scheme of a painting, I add and subtract various elements from the canvas until the overall direction and feeling of the piece emerges. The interaction between myself and the painting often feels like the back and forth of a Jazz improvisation. I consider myself a hybrid of East and West. I am a happy mixture of Tokyo funk-and-groove and New Mexico green chile-picante-salsa-vibes. My paintings are visual poetry and optical music -- playful, uplifting, and whimsical. Born and raised in Tokyo, Japan, Anri Tsutsumi was exposed to American sensibilities at an early age, by parents intrigued with Western Culture. In the 1990s, she had the opportunity to attend the University of New Mexico to study Art and Native American culture. Also after attending the Massachusetts College of Art and countless numbers of art workshops, Anri was inspired to be a contemporary abstract artist. 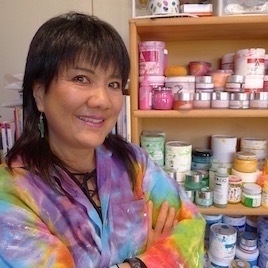 Her unique bi-cultural background and life experiences are becoming integrated and contribute to the evolution of her joyful and exuberant painting style. In recent years, the most significant influences on her art, as well as on her identity as a Japanese woman at home in the American Southwest, have been the stunning landscapes and contrast of earth and sky in the colorful New Mexican desert.